I love sharing information about my favorite herbs with my friends and readers! Educating others about the health and beauty benefits that these natural solutions can provide makes me feel as though I'm able to use my knowledge to help others. This week, I'd like to highlight another herb that is extremely beneficial for natural skin care. Known to many as a marigold, the Calendula flower is one of the most beneficial organic skin care ingredients. Calendula flower is rich in the antioxidants cartenoid and lutein, which could help reduce the appearance of wrinkling and sagging skin that we tend to see as time goes by. Furthermore, the flower is able to help keep skin's youthful appearance. 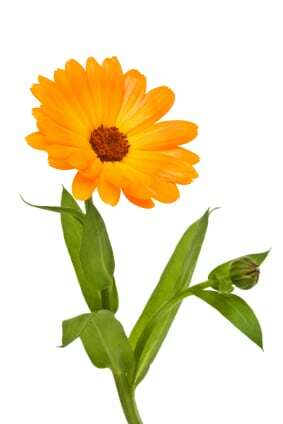 Another excellent benefit of calendula flower is that it can help those who suffer from oily skin. Many times, people with oily skin have overactive or under-regulated sebaceous glands, which can cause clogged pores. Using products that include calendula flower can actually help with oily skin by unclogging pores, without having to use products that are harsh or drying. Calendula flower is a great substitute for mineral oil when you'd like to replace it with a natural humectant. It is able to provide relief from dry skin, as it provides a soothing, calming feeling to the skin. Because of Calendula's moisturizing properties you'll find it included in my Anti-Aging Eye Cream, Anti-Aging Facial Serum and Anti-Aging Facial Oil, as well as my Rosemary Peppermint Body Wash and Herbal Facial Oil for Normal and Combination Skin. Try some Calendula-based products and tell me what you think! It is a very informative article. Thank you.